A screenshot from the short, with Kermit hiding under a table. Kermit's "Between" Lecture was a skit featuring Kermit of Sesame Street, and then the Muppets fame. The skit was part of the 70th episode, which premiered on February 13th, 1970. It was another one of those sketches where Kermit would try to teach the audience about something, but monsters such as Cookie Monster and Beautiful Day Monster would drive him crazy. Kermit's "Between" Lecture has not surfaced since its original 1970 airing. The sketch begins with Kermit demonstrating the word "between" by placing a ping-pong ball, a donut, and a Beatles record on a table to explain how one object (the donut) is between two others (the ping-pong ball and the Beatles record). Out of nowhere, a monster named "Beautiful Day Monster" jumps in and devours all three things on the table, while Kermit hides under the table in fear. Beautiful Day Monster chomps the table to bits as Kermit shakes in fear, preparing for the worst. However, instead of getting eaten, he gets a kiss from Beautiful Day Monster, as a thank-you for the free food. The sketch was mentioned in a "Beautiful Day Monster Appreciation" thread on the MuppetCentral forums, where Kermit apparently described the word "between" as "that far-out, groovy, nifty, keen, really fun word, BETWEEN!" The episode with the sketch in it also has a full rundown on the Muppet Wiki (though the main story segments in that episode may be lost as well, as they are hard to find on the Internet). On July 11th, 2018, a user named Gavry3 created a thread discussing the short. He posted the image seen in the infobox and asked if anyone if they had the sketch. Thirteen days later, a user named Tony answered, stating that he had a German dub of the short, and stated that this dub was where he got the lone still of the sketch, but he doesn't know how to upload it. When Gavry3 asked if Tony could send the short to him, he did not answer back. No one else had come out with anything from the sketch, leaving this one lone screenshot the only visual evidence of its existence. A similar sketch featuring Kermit with the exact same name is easily accessible, but it is not the original sketch from Season 1, as it involves poles (that Grover and another monster are carrying, as they are revealed to be mopping the floor) instead of random objects as in the sketch from Season 1, and it does not involve Beautiful Day Monster. In February 2019, it was announced that over 4500 episodes of Sesame Street over its 49 seasons would be archived in the American Archive of Public Broadcasting. It's likely that the original version of Kermit's "Between" Lecture will be included among the episodes being archived, but this has not been confirmed directly. On February 26, 2019, the German dub of this skit was finally uploaded to YouTube by Tony, but the English version still remains lost. The German dub of the skit. The later Between lecture, not featuring Beautiful Day Monster. 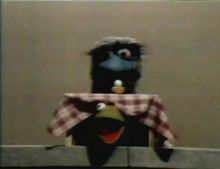 A Muppet Wikia page for Beautiful Day Monster.